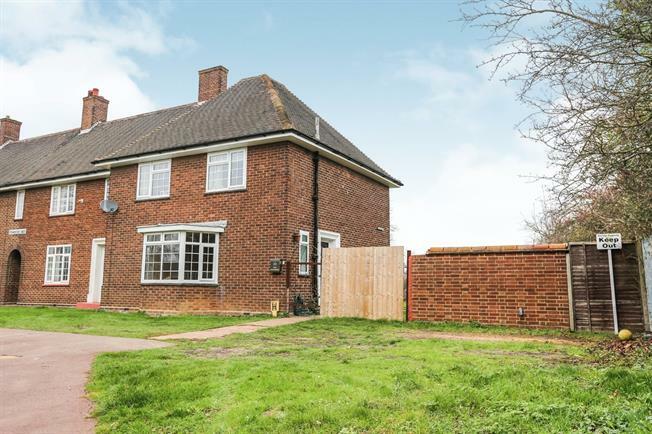 3 Bedroom End of Terrace House For Sale in Bedford for Offers in excess of £250,000. A well presented three bedroom end of terrace family home, located within the desirable village of Stewartby. Accommodation briefly comprises of entrance hall, WC/utility, generous size lounge and a kitchen/diner. First floor comprises three well proportioned bedrooms and a family bathroom. Further benefits include an enclosed rear garden in excess of 100ft, UPVC double glazing and potential to extend (STP). Double glazed UPVC window with frosted glass. Low level WC, top-mounted sink, space and plumbing for washing machine and dryer. Double glazed UPVC bay window to to front aspect. UPVC double glazed door opening onto the garden. Double glazed UPVC window. Roll top work surface, built-in wall and base units, one and a half bowl sink, integrated electric double oven, integrated electric hob. Double bedroom; double glazed UPVC window to front aspect. Double bedroom; double glazed UPVC window. Double glazed UPVC window with frosted glass. Concealed cistern WC, panelled bath with mixer tap, shower over bath, top-mounted sink with mixer tap. Enclosed rear garden mainly laid to lawn in excess of 100ft in length.